Writer Joshua Williamson delivers the second part of The Price story arc in The Flash #64, with pencils by Rafael Sandoval, inks by Jordi Tarragona, and colors by Tomeu Morey, but can he up the interest factor from a lackluster part one? Previously, with Batman and Flash hitting a wall in their investigation of the Sanctuary massacre, the two were drawn into another mystery after the Flash Museum was attacked. With a little coaxing, Batman revealed that he knew the assault came from an ex-protege of his named Gotham Girl, and the hunt began. Unfortunately, the stress of the Sanctuary investigation is taking its toll on both heroes, and things are starting to get tense between the two. The relationship between Batman and Flash is what makes this story move, and Williamson does a good job of showing how well (or not) they work together, even under dire circumstances. These two have long been the detectives of the Justice League, so there is a lot of fun to be had seeing them working together, admiring each other, and sometimes getting on each other’s nerves. Some of the moments ring a little false, such as Batman saying he’s always wondered who the better detective was between them (c’mon, Batman’s not that modest), but overall, Williamson does amazing character work here, and it’s the best part of the arc, so far. There are also some soul crushing moments this issue where Williamson reminds his readers that Barry just lost his former sidekick, Wally West. Allen has always done his best to put on a smile while doing his work, and this case is no exception, but there are moments where his stress and anxiety creep in, especially since he and Batman are on the trail of Bruce’s former protege Gotham Girl. The mentor failing to protect his mentee hits a little too close to home for Barry, making for well-played, emotionally raw scenes. Hopefully, there are more of these cracks in the veneer on their way over the next few issues, because positive attitude or not, it’s hard to believe Flash is even still standing after such a devastating loss. 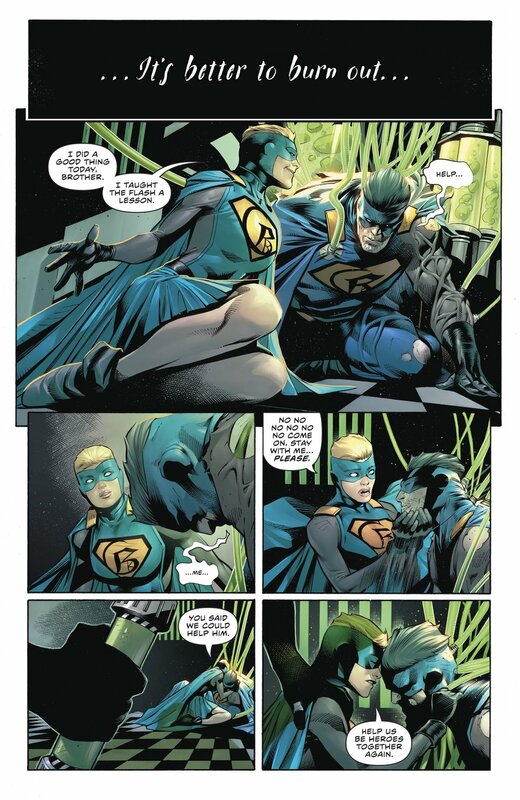 Gotham Girl, herself, is the least interesting part of this arc, unfortunately. Maybe there is some emotional resonance for this character if you’re a reader of Batman, but for everyone else, she’s a cheap knockoff of Supergirl gone wrong, and that concept has already been done to death, itself. Sure, she provides some tension between Flash and Batman, because she represents Batman’s failure to help a protege, just like they both failed to help Wally, but she’s an otherwise boring character that feels like she overstayed her welcome by one-too-many story arcs. Sandoval is a perfect fit for this pairing of heroes, as he handles the kinetic energy of the Flash equally in skill to the dashing, heroic figure of Batman. He delivers the emotion of the issue well, too, slowly progressing from the heroes trading smiles to arguing with each other. Tarragona and Morey, on inks and colors, similarly add to that transition, as the panels grow darker throughout the issue. This art team was well-chosen, and they’re undoubtedly the best part of the Gotham Girl scenes, which are otherwise unengaging. In the end, this issue was a major improvement over the first part of The Price story, but it’s still a little uneven tone-wise. At times, it feels like a fun team up, with a thin excuse for its heroes to get together, and then it abruptly reminds you that said heroes are dealing with major losses, and are barely holding it together. Only the upcoming issues will tell if this is a memorable addendum to the terrible events of Heroes In Crisis, or a fruitless filler story. As of now, it’s leaning towards the latter.